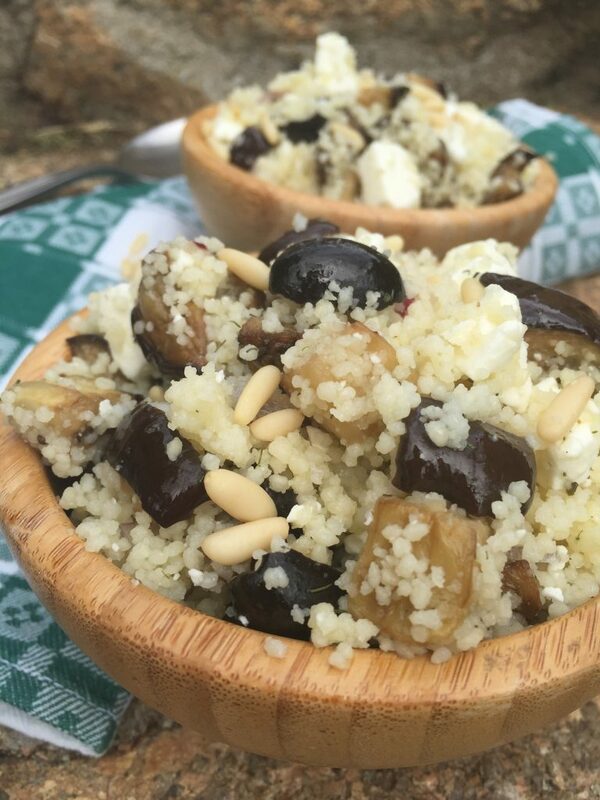 This warm roasted eggplant couscous salad is packed with Mediterranean flavours, from pine nuts and kalamata olives, to cumin, dill, and tangy feta cheese. It’s perfect as a clean eating side dish for barbecued meats, or can be enjoyed as a vegetarian one-bowl meal all on its own. The vegetables in our garden are dwindling, and the eggplant’s days are numbered. It saddens me that we’ll no longer have fresh vegetables at our fingertips throughout the winter. On the other hand, I can’t complain since we’ve eaten enough eggplant this summer to last us all year. What better way to use up those remaining eggplant than by roasting them? Roasting brings out the natural sweetness of any vegetable, and since eggplant tend to be slightly bitter, this is an ideal way to prepare them. The couscous (actually this entire dish) was an afterthought. Couscous is an ingredient that often gets confused as a grain. On the contrary, it’s tiny pieces of pasta-basically the equivalent of whole wheat pasta. The great thing about couscous is that it literally takes 5 minutes to prepare. 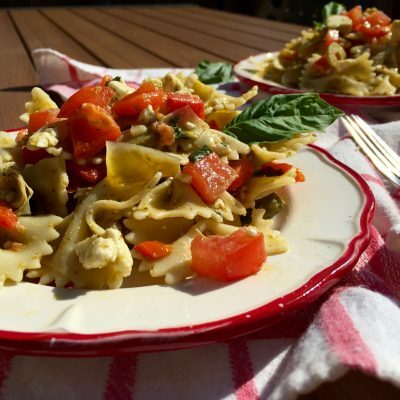 It is the ultimate quick-fix meal during busy weeknights. Couscous is lighter and more nutrient-dense than refined pasta, and on top of that, it has a wonderful way of absorbing all the flavours you combine it with. 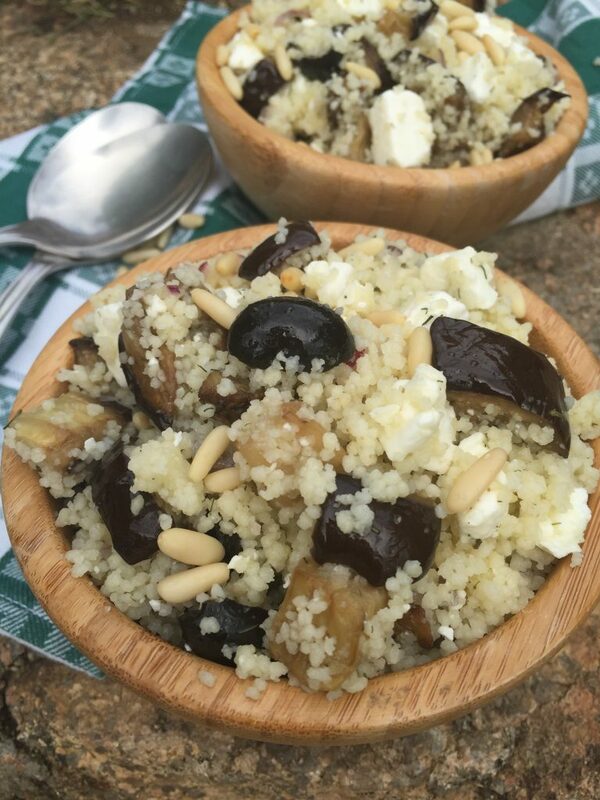 Clean eating doesn’t get any easier than preparing a quick and easy bowl of this roasted eggplant couscous salad. We love this salad as is however, you can add any of your favourite ingredients. The beauty of salads is that you can personalize them to suit your tastes. Add-ins such as cherry tomatoes, cucumbers, and roasted red peppers would marry well with this salad, as would swapping the dill with other earthy herbs and spices, like oregano, or fresh parsley or coriander leaves. Don’t be afraid to experiment with a variety of flavours and make this healthy, hearty salad your own! Preheat the oven to 400 degrees. Remove the stems from the eggplant then chop into 1 inch cubes. Place the cubes on a large baking sheet lined with parchment paper. Drizzle with 3 tablespoons of olive oil and sprinkle with salt and pepper. Toss to coat. Roast the eggplant, stirring occasionally for 35-40 minutes or until tender. Meanwhile, prepare the couscous. Bring the water (seasoned with salt, to taste) to a boil in a small pot. Once boiling, add the couscous, stir with a fork until combined with the water then remove from the heat and cover with a lid for 5-7 minutes. Fluff gently with a fork to separate the chunky bits once cooled. 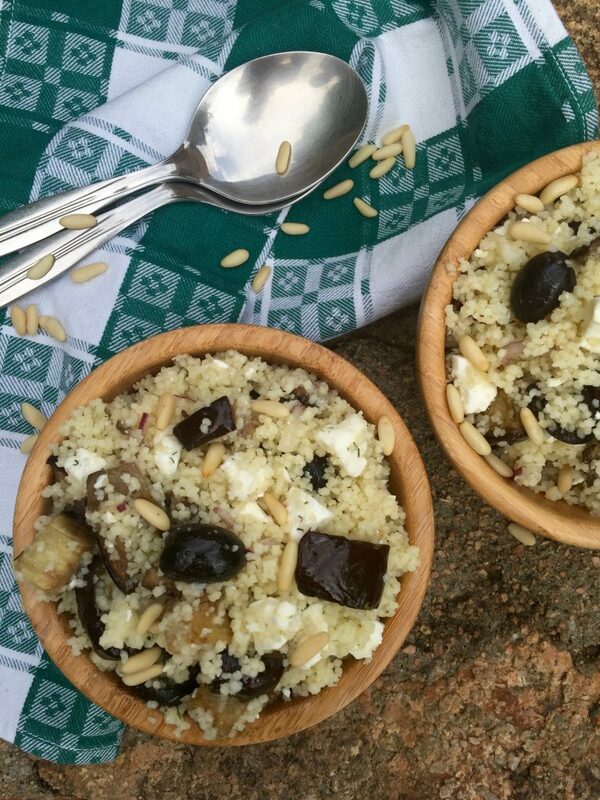 Transfer the couscous to a large serving bowl, add the eggplant and the remaining ingredients and stir to combine. Serve immediately or set aside to allow the flavours to combine. Serve this salad cold, at room temperature or warmed. It stays fresh in the fridge for up to 5 days. Seems quite healthy and nutty. add in this dish are the olives. My family are not olive eaters. Really? I couldn’t live without it! This will still be delicious without the olives! This couscous salad looks delish! I really enjoy eggplant, I just don’t eat it very often. I can see this salad becoming a favorite meal, at least for me. The rest of my family would probably prefer it as just a side dish. That’s how I serve it…I don’t eat meat so my husband bbq’s some steaks or burgers for him and the kids and they have this as a side, while I have it as a main. This looks like a really fresh and healthy dish. I have never really experimented with eggplant but I should try this. To be honest I have never tried couscous either. I do love unique salads though so I bet this is awesome to enjoy! Eggplant is fantastic as a substitute for me, that’s why eat it so often! And couscous is SO quick and easy to make that it’s definitely worth a go at it! 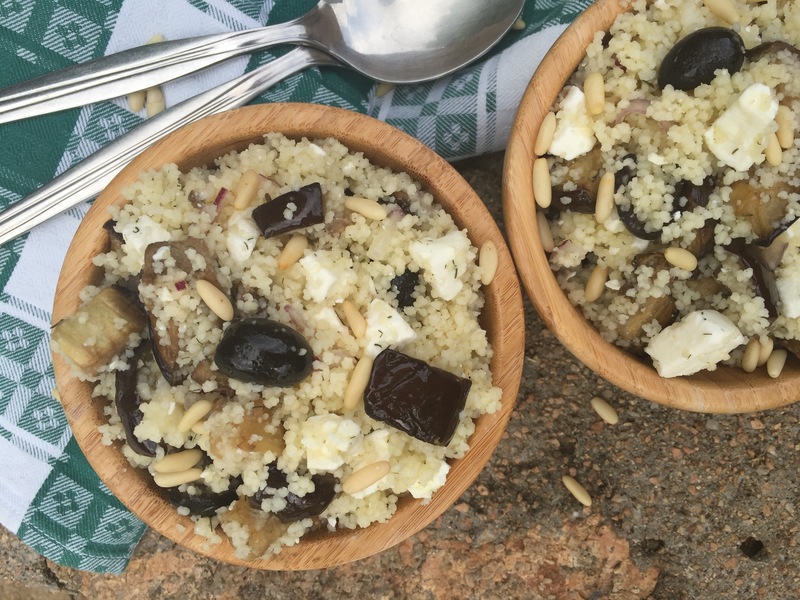 Couscous and eggplant are definitely something that we don’t eat everyday. I seriously want to try this recipe though. It looks really delicious and filling! Actually, neither do we! This is the first time I’ve prepared the two together. 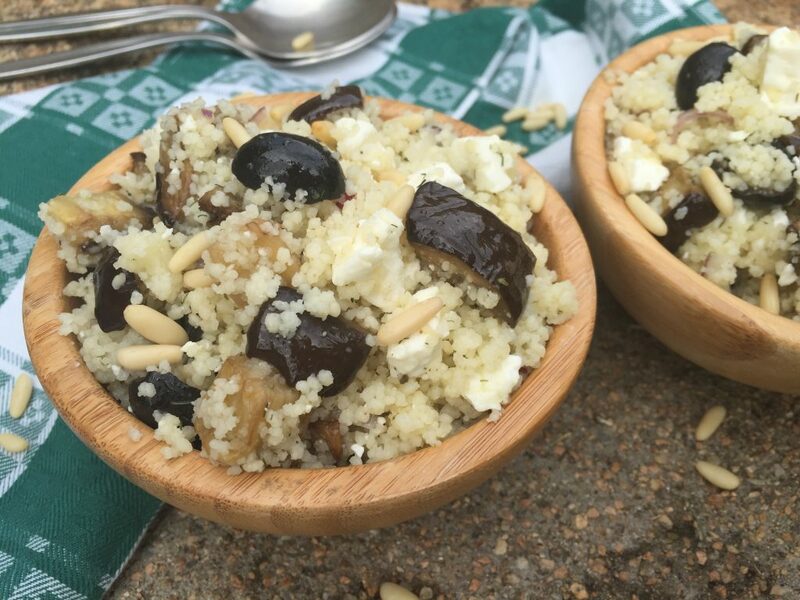 Eggplant is a constant in our house, but not couscous. I have never had couscous before but I heard it is really good. This looks like a good recipe to try out for the first time. I will have to make it for my mom and me as my husband is not very interested in trying new stuff but I think my mom would live it! It’s grainy like pasta or rice but much lighter. This salad is filling but it’s not heavy at all. Now, this looks so good! I thank you so much for listing the recipe I am going to have to try it out without the pine nuts and dill. I wonder how cashews would do in the dish? I think any nut could work in this, but yes, definitely cashews! Great idea! I am not really familiar with cooking couscous but I use quinoa all the time. I do love grains though and eggplant equally. So I can imagine that this tastes very good. 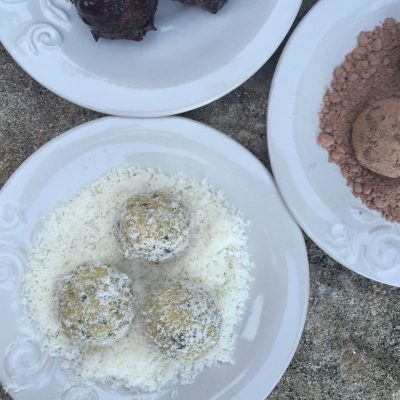 I think if I made this, I would add either dried cranberries or dried pomegranate pernils. I love egg plant and roasting them is definitely a yummy way to serve them in a meal. I hear you about being sad that colder months ahead equals dwindling fresh veggie supply from our own backyards. Thanks for sharing this! Roasting them is THE best way to prepare…at least I think so! Ive never been brave enough to use eggplant or couscous. However, after reading about the health benefits, I think I’ll give this recipe a try! Oh! I also wanted to say that I love those bowls! Where did you get them? They’re not mine actually…I borrowed them from my sister-in-law while I was staying (and blogging) in Italy! I’m pretty sure she got them at Ikea! You don’t have to be brave…they’re literally fool-proof to prepare!